Over the years our teeth can become worn and discoloured, which is not the best look in an era when a healthy attractive smile is important and can be an asset. So if you’re wondering how those celebrities on television and in magazines manage to maintain a gleaming white smile at seemingly any age, read on for information! Teeth staining can result from foods and beverages and also from tooth damage, teeth grinding, smoking, some medications, and root canal treatments. There are basically two types of tooth stains – extrinsic and intrinsic. Extrinsic stains are more superficial, and usually result from foods and drinks such as soy sauce, coffee and red wine, and in many cases may be removed through brushing. Intrinsic stains on the other hand go deeper and often occur due to the effects of ageing, mineral exposure, neglect, excessive fluoride or acidic substances. As the tooth enamel wears down and cracks, the underlying yellowish dentine starts to appear and the teeth also become more susceptible to staining from substances. The good news is that even cases of intrinsic staining can often be improved with whitening treatments, or other options such as veneers where whitening isn’t recommended. A good professional clean by a dentist once or twice a year is very effective for removing built-up plaque and stains and improving the appearance of your smile. However, it does more than that as it also helps to keep your teeth healthier and less prone to decay and loss. Whitening treatments by a professional dentist in Sydney can lighten your teeth by several shades. This often involves applying a hydrogen peroxide gel treatment to break down tooth stains and whiten the teeth, and may also be accompanied by laser light treatment to accelerate the process. A home treatment kit in the form of gel and customised trays may also be provided to the patient for maintenance and touch-ups. Professional teeth whitening does not harm the tooth structure. In-tooth bleaching may also be used at some clinics for whitening teeth that have been darkened by root canal treatments. A particular benefit of professional whitening treatments is that you get to choose the shade, so if you don’t think super-white teeth will suit you, you can always take it down a notch or two if that’s your preference. 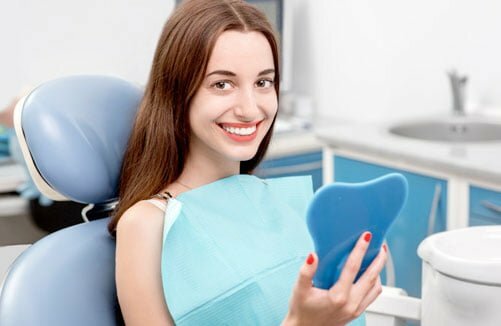 In any case if you would like a whiter smile, it’s important to discuss your options with your dentist to find out what you can realistically expect from whitening treatments. These may be somewhat useful for people wanting only minimal whitening as the products in them are of a lower concentration than those used by dentists. They are also more of a one-size approach rather than being customised for each individual case. They also do not provide any protection against any resulting tooth sensitivity. Daily brushing and flossing is of course important for whiter teeth, especially after eating foods and drinks that cause staining. Cleaning with a product containing sodium bicarbonate may help to keep your teeth looking whiter for longer. A laboratory study published in the Journal of Clinical Dentistry found that high concentrations of sodium bicarbonate were “more effective at removing intrinsic tooth stain than dentifrices that do not contain sodium bicarbonate”. However it’s important that you discuss the best ways to clean and floss your teeth with your dentist. To discuss whitening treatments or other treatment options in more detail, feel free to contact our professional team at the Marsfield Dental Care clinic in Sydney’s north. While it s unrealistic to expect that your teeth will remain shiny and very white into older age, many factors that accelerate the rate of teeth discoloration can be avoided. It involves knowing the right overall dental hygiene, so that you can teach your child how to care for her own teeth throughout her lifetime. One of the most important steps in ensuring that you keep your own healthy teeth for life is having a good relationship with your dentist.